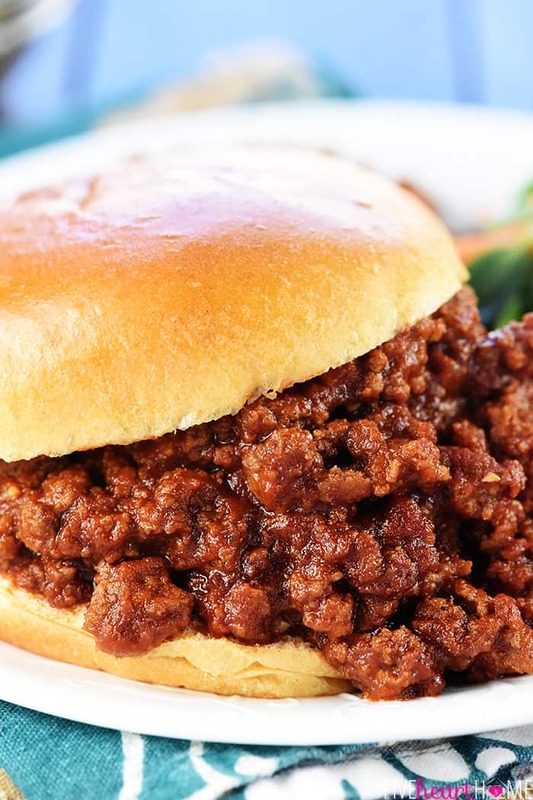 The BEST Homemade Sloppy Joe recipe tastes delicious and is quick and easy to make using real ingredients instead of a store-bought can of sauce! 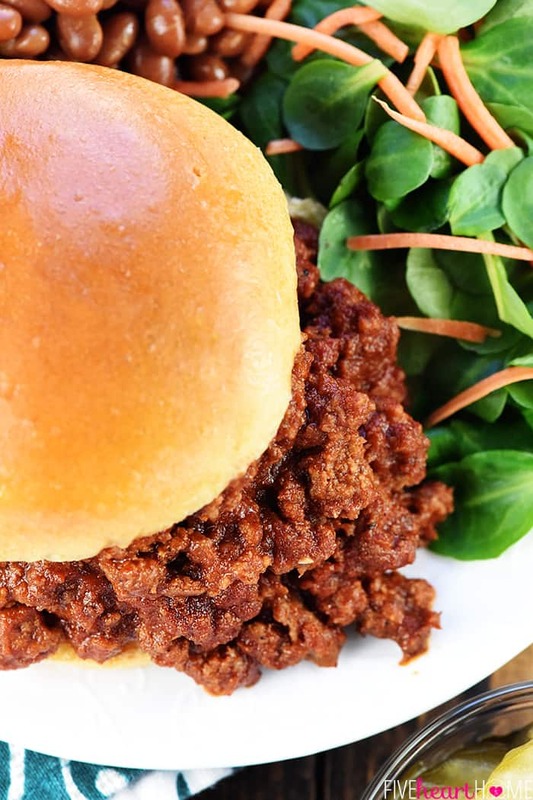 There aren’t many dinners that you can get on the table faster than whipping up a Sloppy Joe recipe. And while the store-bought sauce that rhymes with San-wich might make this meal even quicker, it’s got some less-than-ideal ingredients. After all, I tend to avoid high fructose corn syrup in my sweets, much less my dinner. So what’s a Sloppy Joe-lovin’ family to do? Why, put together your own quick and easy, all-natural sauce, of course! 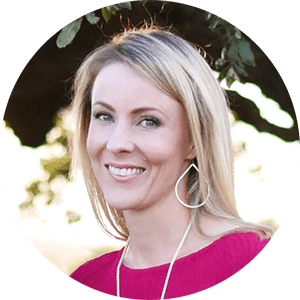 It only takes a couple of minutes, it tastes soooo much better (in fact, you get to control how sweet and/or salty you want it), and you don’t have to worry about any unnecessary additives. 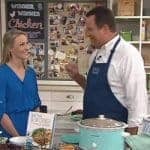 I shared my Slow Cooker Chicken Sloppy Joes awhile back, which feature this same sauce, but sometimes you don’t have the forethought (or time) to toss something into the crock pot first thing in the morning. 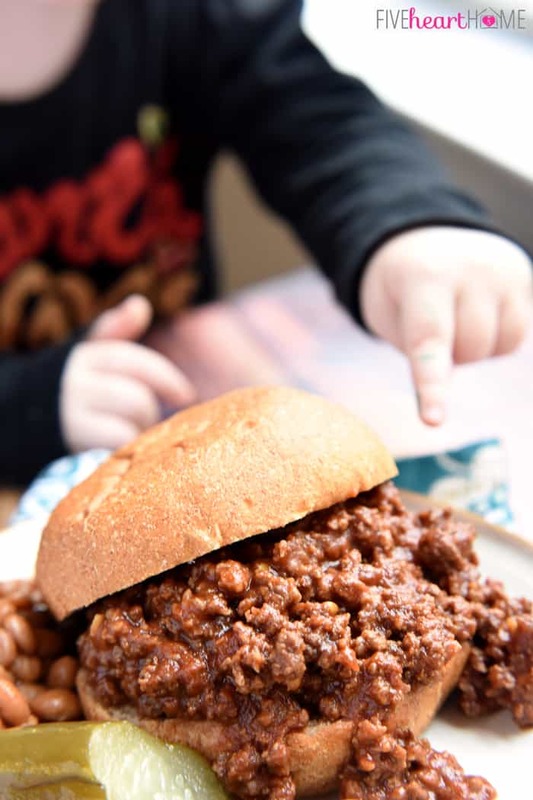 So if you still want an effortless, family-pleasing meal come 5 o’clock, make this tried-and-true Sloppy Joe recipe! Simply brown some ground beef (or turkey), stir together a simple homemade sauce, and then combine the two. Allow the mixture to simmer on the stove for a few minutes and then slap it on some buns. Easy peasy! There’s really not much more to say about this recipe, folks. Kids adore it, but adults love it, too. It’s so simple but oh-so-good. A side salad, some baked beans, and — of course — some thickly-sliced pickles on top of your Sloppy Joes, and…dinner is served! If you’re making your own Sloppy Joe sauce in order to avoid processed ingredients, be sure to use all-natural ketchup. This Sloppy Joe sauce is intended to be slightly sweet, but it’s really a matter of taste. If you prefer a more savory sauce, feel free to use less brown sugar. Additionally, you may use unrefined sugar (or even a squeeze of honey) in place of the brown sugar, if you wish. If you like your Sloppy Joe meat with onions and peppers, you may dice up half an onion and half a bell pepper and cook them in a tablespoon of olive oil until softened (about 5 to 10 minutes) before browning the beef. Remove the onions and peppers from the pot and proceed with the recipe, cooking the meat and then stirring the onions/peppers back in at the same time you add the sauce. 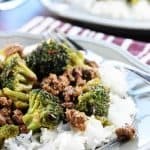 Along those same lines, if you’d like to make this meal even healthier by packing in some extra veggies unbeknownst to your kids (or your hubby), be sure to check out my How to Get Your Kids to Eat Their Veggies post, which specifically addresses Sloppy Joes. My family loves Sloppy Joes so much that I’ve also come up with a zesty Tex-Mex version…olè! If, like me, you make a lot of ground beef (or ground turkey) recipes, this tool is pretty darn handy for breaking up your meat. Be sure to check out the recipe video below to see just how quick and easy this recipe really is! 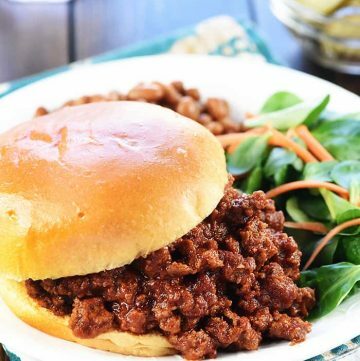 Homemade Sloppy Joes taste delicious and are quick and easy to make using real ingredients in lieu of a store-bought can of sauce! Set a large pot over medium-low heat. Add a few drops of extra-virgin olive oil, and saute the garlic for a minute or two until just fragrant and very light golden brown. Add ground beef, increase heat to medium/medium high, and cook until no longer pink, breaking apart and stirring as meat cooks. Drain grease from meat. While meat is browning, make sauce. In a medium bowl, stir together tomato sauce, ketchup, brown sugar, Worcestershire sauce, mustard, garlic powder, onion powder, and freshly ground black pepper, to taste, until well combined. Pour over browned meat, stir, and simmer for a few minutes until heated through (or longer, if you have time, to allow the flavors to meld). Serve on hamburger buns or rolls with sliced pickles on top. 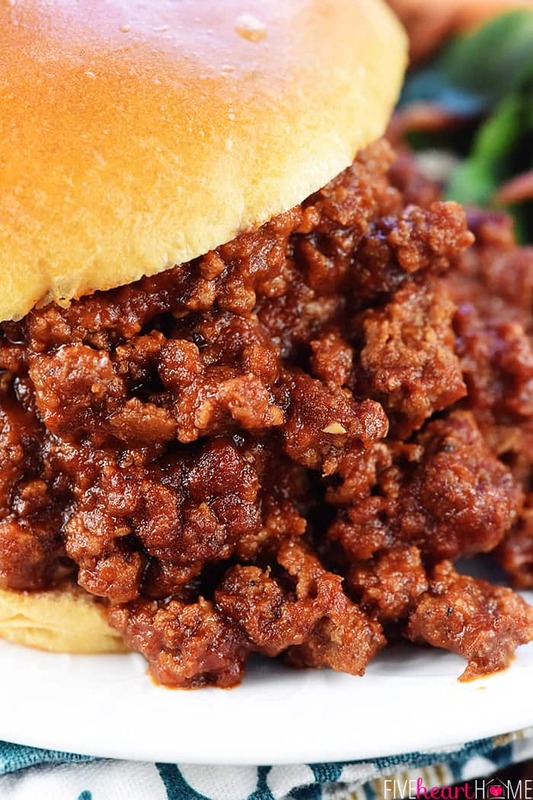 This Sloppy Joe sauce is intended to be slightly sweet, but it's really a matter of taste. If you prefer a more savory sauce, feel free to use less brown sugar. Additionally, you may use unrefined sugar (or even a squeeze of honey) in place of the brown sugar, if you wish. Post originally published on January 13, 2015…back when my two-year-old couldn’t keep her little marker-stained mitts away long enough for me to snap a few pictures. 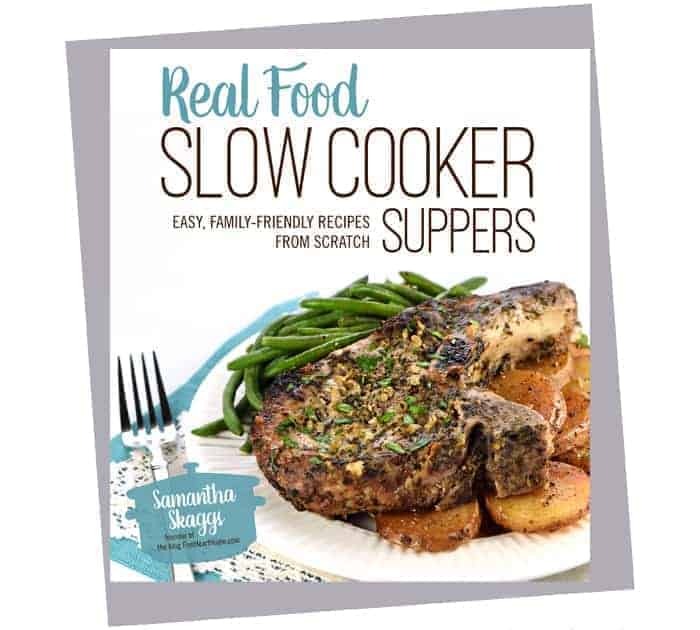 ‘Real Food Slow Cooker Suppers’ Cookbook ~ QVC Appearance Recap! I love the flavor and it’s so simple to cook. Thanks for the recipe. 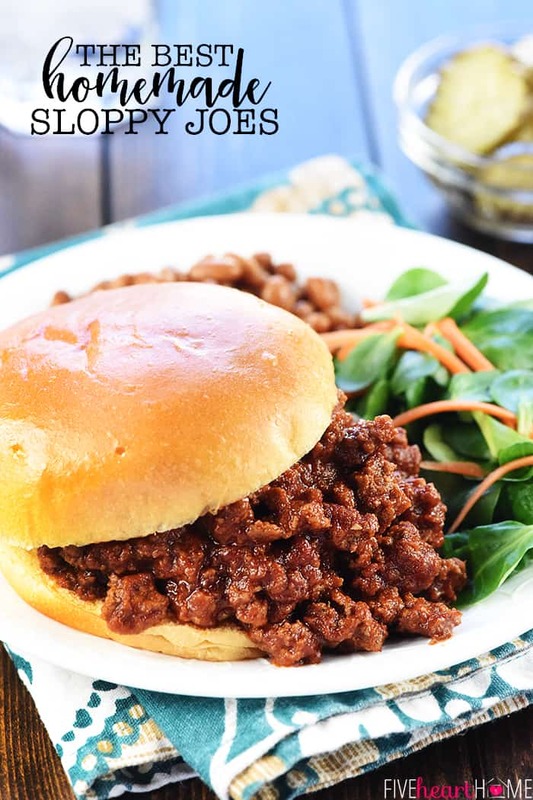 Finally, a sloppy joe recipe without peppers! I did add the onion, and I doubled the recipe because my husband can eat 4 sandwiches in the blink of an eye, and I wanted some! This is a keeper for me. He loves sloppy Joe’s and he’s been asking for them. This fit the bill! Ok seriously love this ! I’ve made it twice and I won’t stop but mine never comes out dark like yours ! Why not ?! A friend gave me this recipe when I asked about how she made hers and hers was also very dark in color compared to mine . I even saw t and eat it in person . Yum ! I love Sloppy Joe sandwiches and I’m with you on the fact that I hate the canned stuff. Too much high fructose and other additives for me. 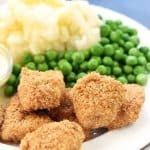 This is a delicious looking and great quick and easy meal that everyone in the family will love. Just looking at all that mouthwatering goodness is making me hungry! These really are the best sloppy joes! My whole family loved them and I can’t wait to make them again! Delicious! Instead of pickles I just added a little pickle juice to the meat mix. 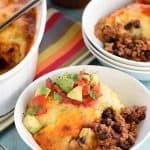 My go to recipe now. Thanks for sharing. 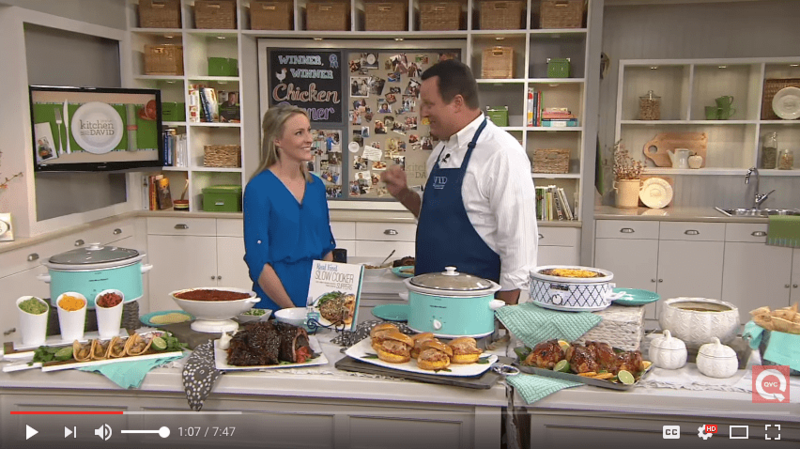 Great idea, Monique…we always put pickle slices on our Sloppy Joes but I never thought to put pickle juice in the meat! I really like it, its taste is great. Thank you for your recipe. So easy to make. Thank you so much!